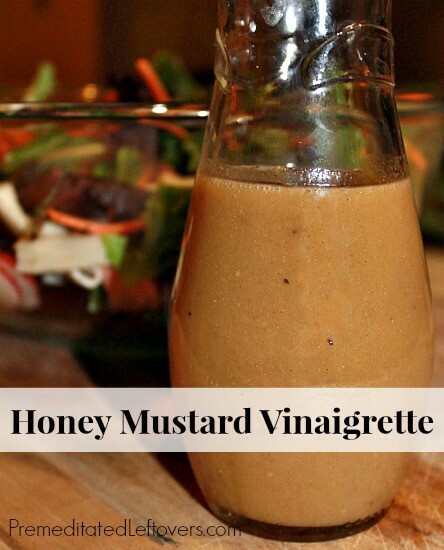 This Honey Mustard Vinaigrette is a simple salad dressing to make. This recipe is also easy to remember and easy to adjust since you use equal parts of the four main ingredients. I like making my own salad dressings because it allows me complete control over the ingredients. I used Annie's Naturals Organic Dijon Mustard and rice vinegar to make sure that my dressing was gluten-free. 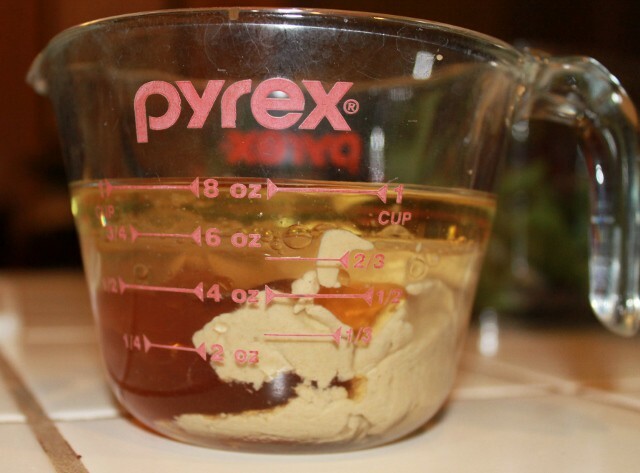 I use a Pyrex Measuring Cup and pour in 1/4 cup of each ingredient and then blend them with a small whisk. This salad dressing is delicious on a side salad, but you can create add chicken to the salad and make a meal of it. If I have leftover Honey Mustard Vinaigrette, I use it as a marinade for chicken. Combine all of the ingredients in a small bowl. Whisk until thoroughly combined. Serve immediately or store in the refrigerator for up to 2 weeks. Do you like to make homemade salad dressing? If so, I have a few more recipes you may enjoy. Looks delicious! I saved it to try next time we have a salad. By the way, I don’t think I noticed this until now but I love that your recipes are in little boxes with print in the corner. Neat! I love honey mustard salad dressing! Can’t wait to make this and have it here all the time! Thanks so much for sharing for Delicious Dish Tuesday! Thanks for sharing such a great recipe on Allergy-Free Wednesdays! Be sure to check back next week for reader favorites and hostess picks. I’m already a big fan of your Catalina dressing, and this Honey Mustard recipe sounds wonderful. I totally agree, I much prefer homemade dressings for the complete control it gives me over exactly what goes in them. Reading the ingredients list for some of the store bought varieties is positively alarming sometimes! You can’t get much easier than that! My husband loves Honey Mustard Dressing but I can’t recall if I’ve made it for him or not. Thanks for sharing. I can’t wait to try it. I’ve just made this and it tastes wonderful. My husband just raved about it, and I absolutely loved it. I had to cut back a bit on the amount of Dijon mustard by about a tablespoon, but I was using a brand I bought in France that is really super strong. This is such a great recipe to have on hand; thank you for sharing it. I love making my own salad dressing, haven’t bought one in years. I will try this, maybe reduce the honey, since my husband is not a big fan of sweet dressing. Pinning onto my “salads” board. I’m loving this simple recipe! I’m always looking for a good vinaigrette to try, and I’m thinking this one qualifies. 🙂 I hope you can stop on by and share this or any other recipe with us on Five Friday Finds!